The latest addition to UC San Diego’s Stuart Collection was revealed this past weekend and can now be found at the entrance to Roger Revelle College on Ridge Walk, near the university’s Main Gym. The installation, a 195-foot pole entitled What Hath God Wrought, signals the piece’s title in Morse code through the intermittent flashing of red lights from a lantern at the top. The artist, Los Angeles–based Mark Bradford, drew inspiration from the first Morse code message to ever be sent in 1844. The message, which read “WHAT HATH GOD WROUGHT,” marked a critical turning point in the field of communication, eventually paving the way for modern virtual communication. 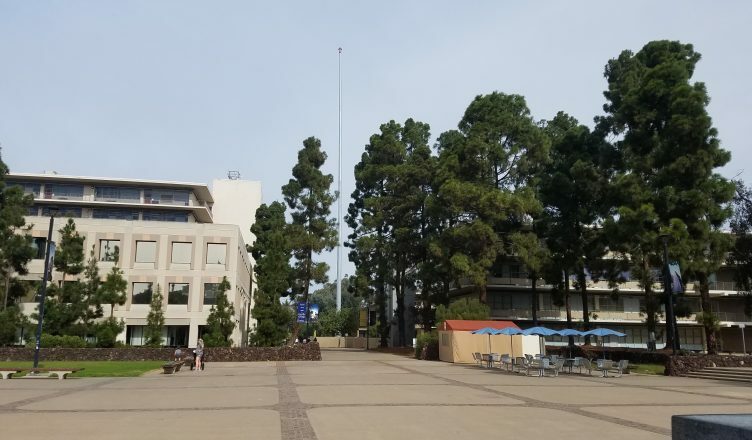 The pole has surpassed Building One in The Village at Torrey Pines in height by a margin of 2 feet, making it the tallest structure on campus. Revelle College Council meeting notes from May 27, 2016 reveal that Bradford’s pole presented a challenge unprecedented in the history of the Stuart Collection: Because of the height of the piece, the design had to be approved by the Federal Aviation Administration before it could be implemented to ensure the safety of low-flying aircraft. “We think it’s a very powerful message about the beginning of communication and [communication] as we know it today,” Stuart Collection director Mary Beebe wrote to the UCSD Guardian. Funding for each addition to the Stuart Collection is privately raised by Beebe. While the concept of What Hath God Wrought is generally lauded by some, others are critical of the aesthetics of the piece. Others are concerned that the installation’s significance is overshadowed by its own appearance. Former Provost of Revelle College Paul Yu shared his thoughts on the latest addition with Beebe. “Among the fog…it looks as if it is reaching the sky and beyond,” Yu said. What Hath God Wrought is the 20th addition to the Stuart Collection. The collection began in 1981, with the mission of preserving and growing UCSD’s outdoor sculpture collection. Notable pieces include Fallen Star, Snake Path, Two Running Violet V Forms (affectionately referred to by students as “giraffe catchers”), and the iconic Sun God statue. This piece has been updated to correct the year the Stuart Art Collection began, as well as the exact height of the piece.